Using distress ink brushed corduroy I sponged a piece of white card making the ink deeper at the edges and I stamped the image with the same distress ink, using a brown ink pen I grounded the image by adding a shadow under the wheels. 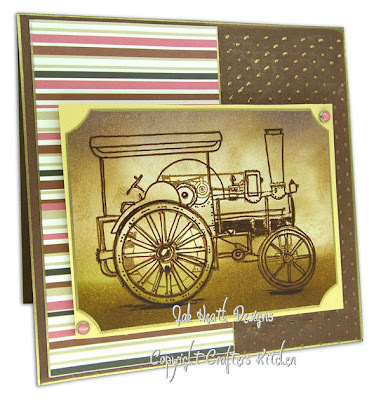 The brown card base was embossed with a swiss dots cuttlebug folder then a gold ink pad rubbed over the top. Very arty, ideal for any man. Love it. Wow, hard to believe that wa a white ard to start! I wish I had some of that distress ink!! Lovely jubbly Jak love the image and the effect is great. Lovely card, Jak and superbly coloured- great techniques. Oh wow, that is fabulous. Makes me think of Fred Dibnah (RIP). Superb card. Love the colours. I like the idea of colouring under the wheels to 'ground' it. I might try that.